Thank you for visiting our BaptismSong.com website. 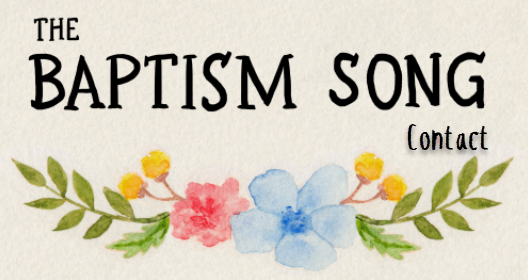 We hope that you and your children find comfort in the words of The Baptism Song every time you hear them and sing them. My daddy sings The Baptism Song to me and my brothers every night as a lullaby. I normally fall asleep when I hear the word “tiny”. If you would like to contact us please fill out the form below. It is the quickest way to get in touch with us because we get so many phone calls that we just can't respond for a long time. Normally I'm doing my homework and Daddy has to take care of all the rest. Mommy and Daddy don't let me answer calls from people we don't know. If you would like for me to be interviewed, make a special note on your submission and Daddy will get back to you as soon as possible. A lot of people want to interview Mentol. She lives on the other side of the world in the country of Indonesia, and the time is very different. When it's 7 in the morning here it is 7 at night there. Please contact us and we will communicate to her. A lot of people want to interview Jen (mommy) who sings The Baptism Song and Baby Dedication Song. Please contact us and we will communicate to her. If you would like us to autograph your copy of The Baptism Song Book, please mail it to our address. Ensure that you include return postage. It works best if we receive your book with a return postage paid U.S. Mail envelope. People normally fold the return envelope into the envelope that they send the book with, and then we put the signed book at into the new envelope and send it back to you. I don't get a lot of allowance so I won't be able to afford to send it back if I have to pay the postage. ​Copyright 2018 All rights reserved.